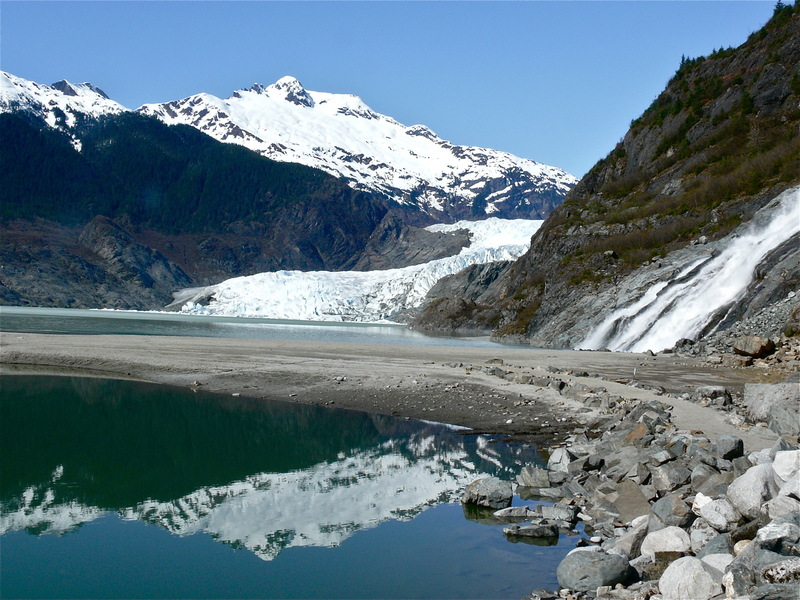 Back with Aki in Juneau, we take the trail to Nugget Falls because it is convenient to the store that sells the dry roasted almonds—not because from the trail you can catch the reflection of glacier and sharp edged mountains in the thawed edges of Mendenhall Lake. 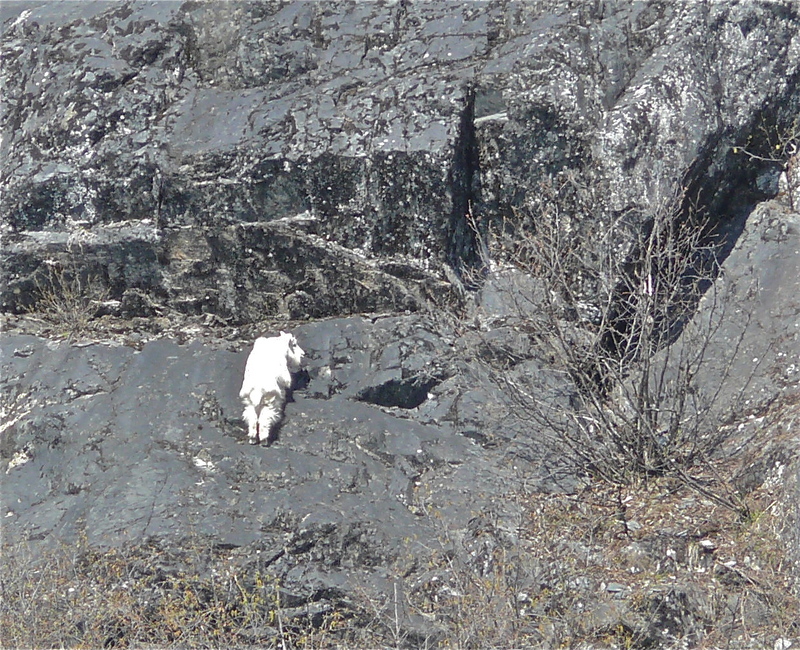 We didn’t pick it because of the mountain goats–with their shaggy white coats—that munch on emerging growth on the rock walls above the falls. We didn’t even consider the falls the attraction even though thy plunge down a granite wall with roar that discourages conversation. 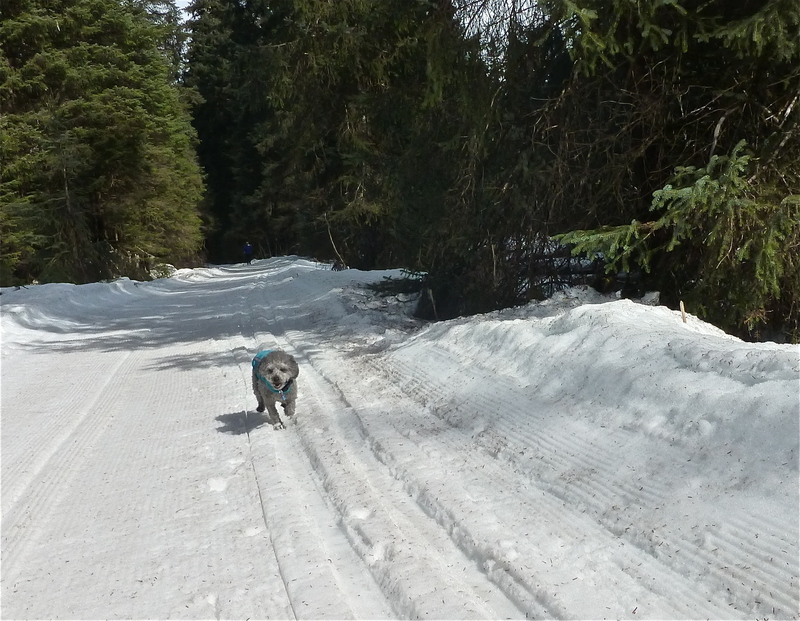 We chose the trail for it proximity to shopping and because nothing along the trail grows tall enough to block the sun that warms Aki’s grey fur and softens the remaining lake ice like spring sun should do at the end of April. While Aki chases after her orange frisbee I watch a mountain goat search a bare rock face for food. Like a child trying to steal candy secreted on a tall shelf, the goat rocks onto the tips of his rear cloven hooves and stretches out for soft spring growth that is almost out of reach. 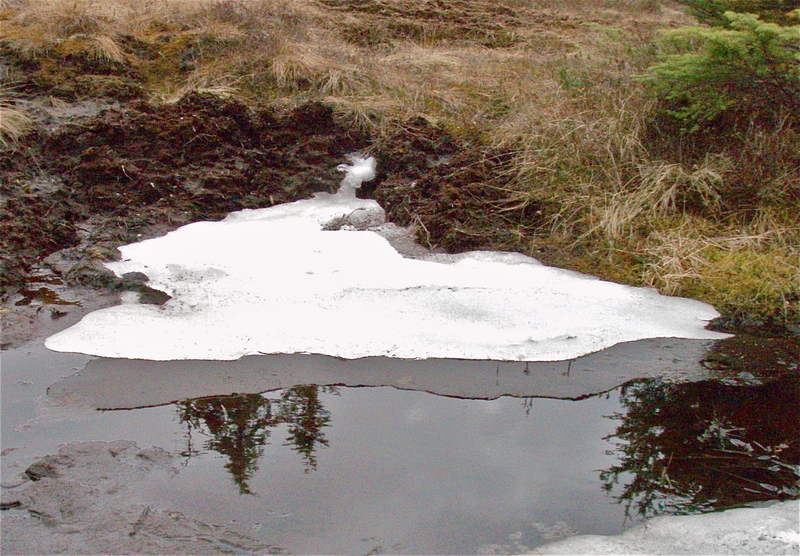 This entry was posted in Aki, Dan Branch, glacier moraine, Juneau, Kwethluk, Nature, Southeast Alaska on April 30, 2014 by Dan Branch. Last evening wind-created fog obscured our view of the headlands to the the north. 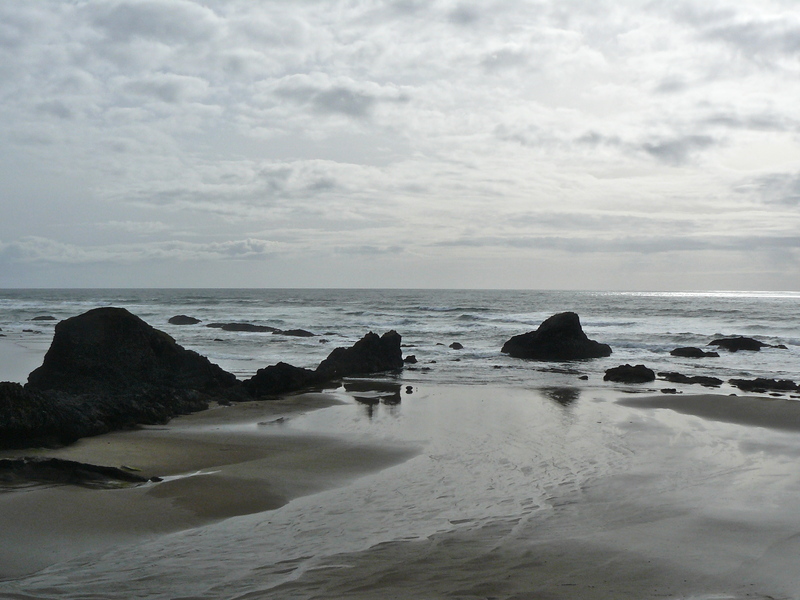 All day heavy rain had eroded tracks into the sides of soft-soiled cliffs had stopped by then but a strong southerly wind soaked my pants in seconds. A small clutch of crows hunkered on the beach looking for food. All night the wind blew hard, knocking moisture from surrounding spruce trees onto yurt where we slept. I prayed that the storm would blow itself out. This morning, the wind still blows but at a manageable speed and there is sun. An osprey hovers down beach and them floats toward me. Built for soaring, it lets the wind carry it, shifting a wing or tail feather now and then to stay on course. Beyond the breakers, a quarter section of rainbow strengthens then disappears when a new wall of storm clouds blocks the sun. 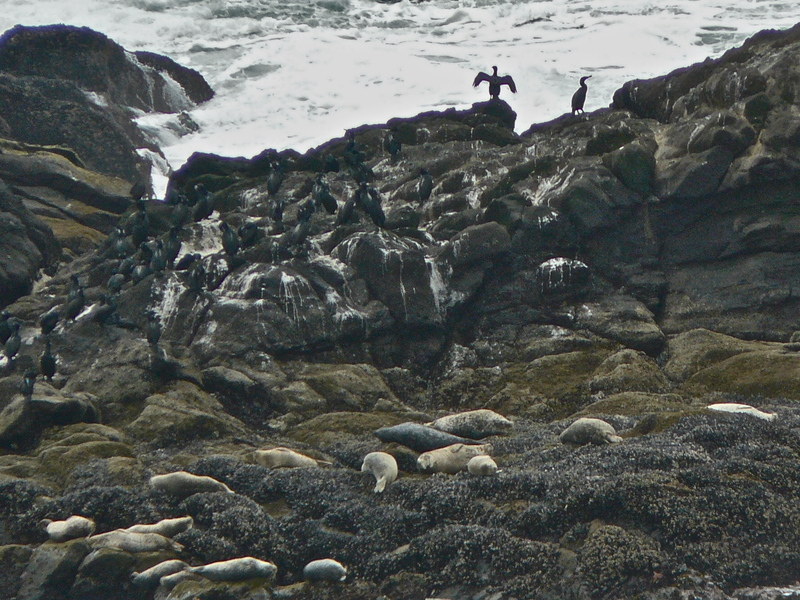 Later we return to the beach and find a gull trying to pull flesh from a cormorant carcass. 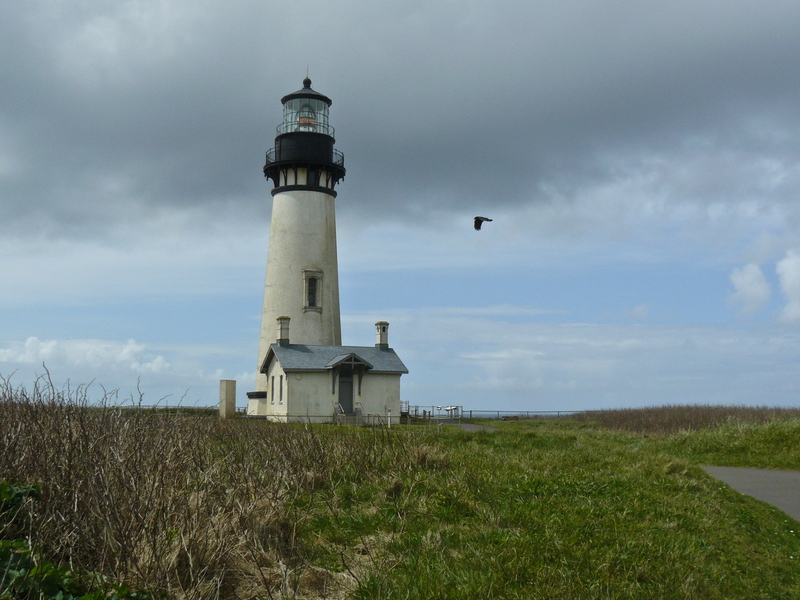 His efforts draw a crowd–8 turkey vultures and a bald eagle that swoops low over the body and then pulls skyward over the surf. One vulture, its red, naked head catching some morning light, worries the cormorant bones for a minute and then leaves it for the lone gull. In the afternoon we learn that the cormorant is one of several that have died recently. No one knows why, I wonder if the birds ate some of the plastic bits scattered on the beach like holiday confetti by the flood tide. Never having seen the gaudy decorations on the beach before I wonder if they are the Japanese Tsunami debris, made small by currents and storms that delivered it to this Oregon Beach. Later, on another beach, we read a sign asking people to help collect Tsunami plastic items that gather on the sand. April 28 Portland I was not surprised by osprey that flew over me at Beverly Beach, a place rich in silence and food for raptors. But in the city, in Portland, it seemed so out of place. True, we were riding on along side train tracks that bordered along a reedy lake. True, we stopped hearing city sounds a few minutes before, blocked by an island in the Willamette River. The bird didn’t care if he was expected. We stopped and watched it hover and then dive. 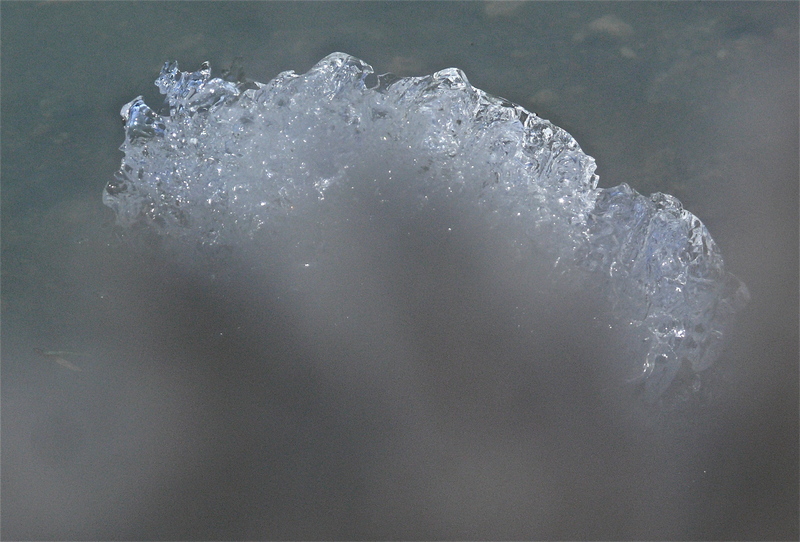 Concentric rings expanded from the spot where its talons touched the water but missed the prey. Three rings dotted the lake waters until, on the fourth try, the osprey secured a meal. 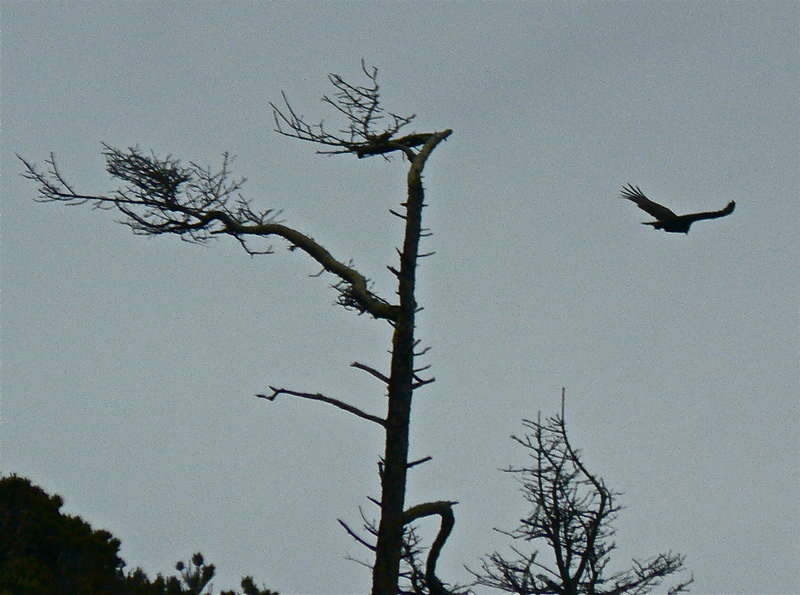 Like mountain lions, coyotes, and Juneau’s black bears, ospreys hunt in wild urban places. This entry was posted in Dan Branch, Nature on April 29, 2014 by Dan Branch. 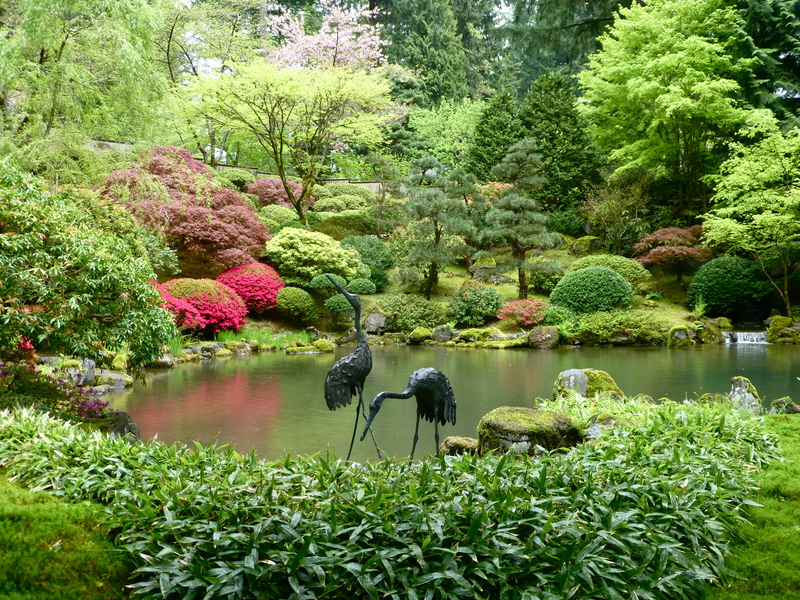 This entry was posted in Dan Branch, Nature, solitude, Uncategorized and tagged poetry on April 27, 2014 by Dan Branch. Spring will come late to this working class stream but it will take away much beauty when it does arrive. Winding through a tight little valley and less and a mile from the Juneau Ice Field, Montana Creek will run around snow covered rocks for at least a couple of more weeks. The departing winter’s snow, ice, and hoar frost makes the beauty here. Without snow, this wonderful ski trail becomes a tired gravel road to nowhere; the creek a claustrophobic spawning ground for several species of salmon. They will draw the bears and eagles and ravens and herons who will hide from my view in thick riverine forest. 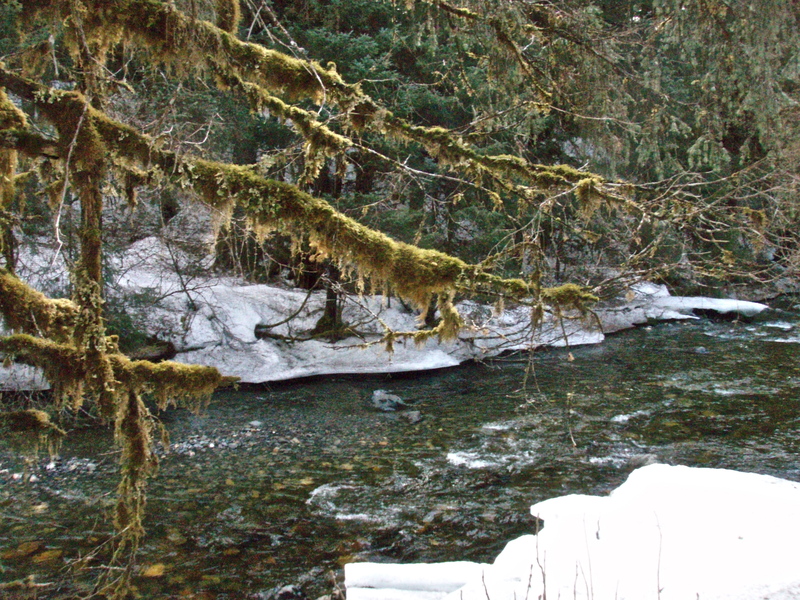 Winter and summer, rifle and shotgun blasts spice up almost every visit to the creek. The gun range was almost packed when we climbed into our skis. Since is such an an odd way to honor the pascal sacrifice, I wonder if those sighting down the barrels of their expensive rifles are celebrants in a church of gun powder and shot. Aki tries to ignore the near constant barrage but I can tell she is bothered by the bangs and booms. 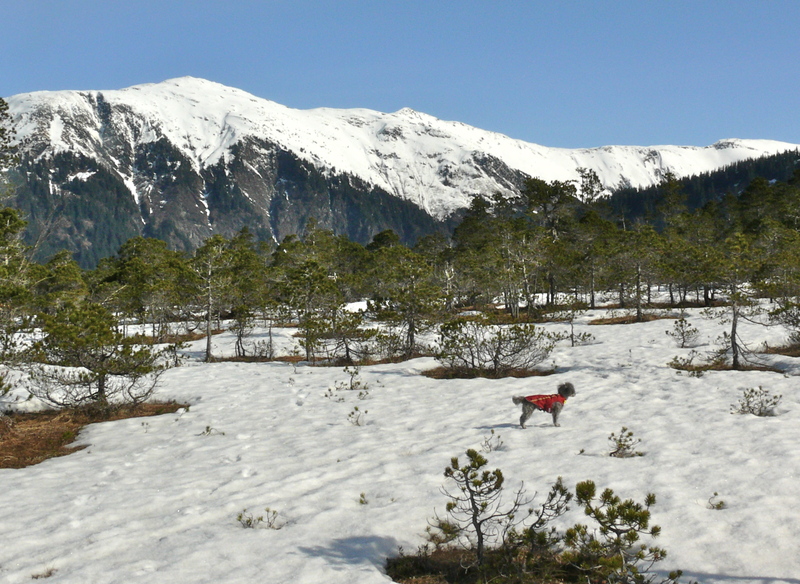 This entry was posted in Aki, Cross Country Skiing, Dan Branch, Juneau, Nature, Southeast Alaska on April 20, 2014 by Dan Branch. The crows patrol this creek delta like rent-a-cops at a rock concert. One watches a few feet from the trail as my little dog passes by. Aki ignores it and the other crows policing the area. She doesn’t show any interest in the hundreds of migrating fowl that have stopped here for a top off before moving north. 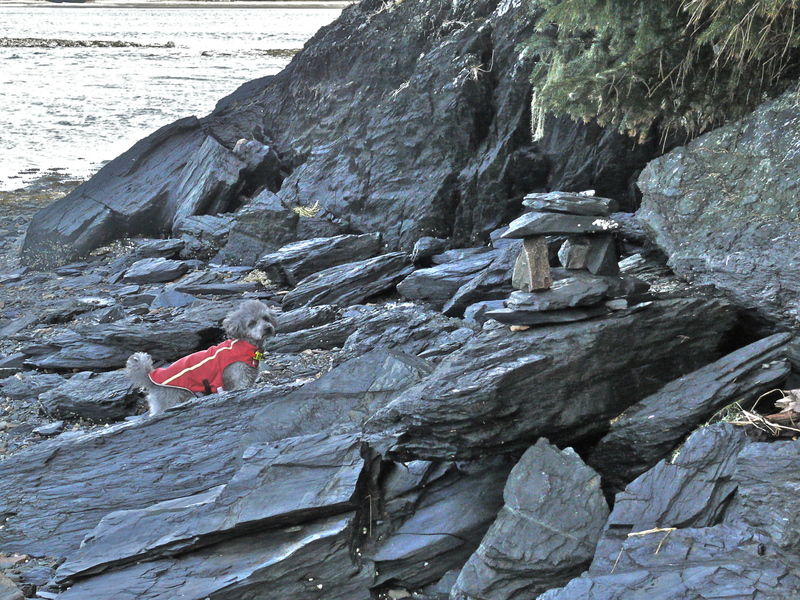 Only a small Kanji formed with found beach rocks intrigues the little dog. She barks, then growls like a Ewok before approaching it with head low. Looking a little foolish, Aki gauges my response to this new trail side shrine and then pads on down the beach. 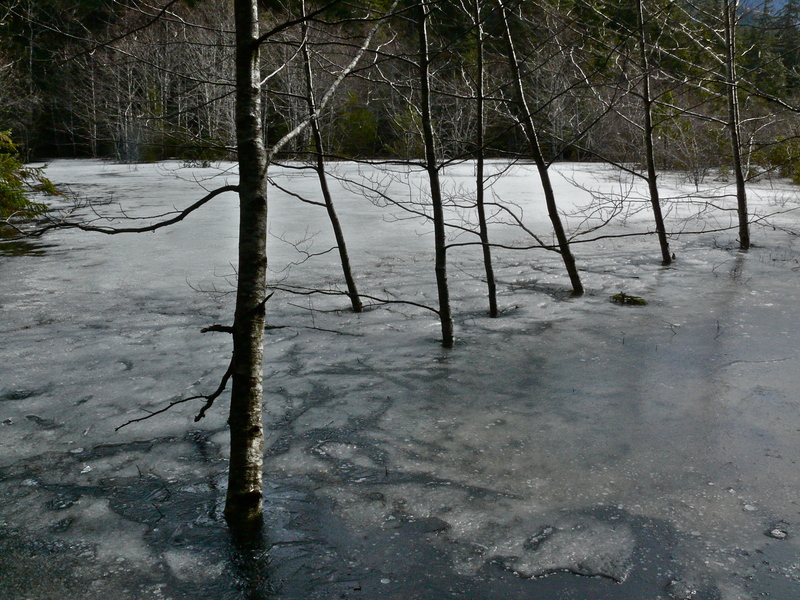 Around the corner, Barrow goldeneyes are having a blast on the pond—splashing and rising up until almost free of the water and then more splashing. It’s 52 degrees and the sun brightens the dull, death beach grass until it competes with the snow covered mountains and glacier for our attention. 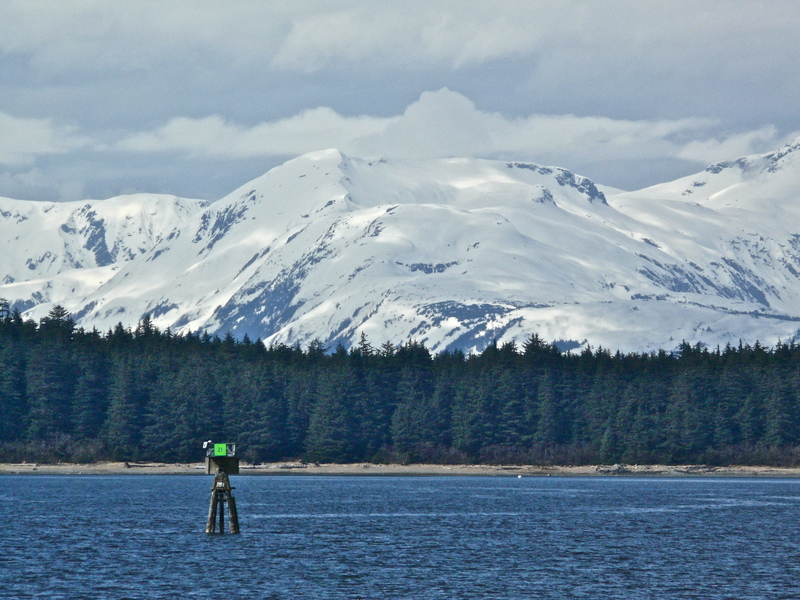 This entry was posted in Aki, Dan Branch, Juneau, Nature, Southeast Alaska on April 15, 2014 by Dan Branch. 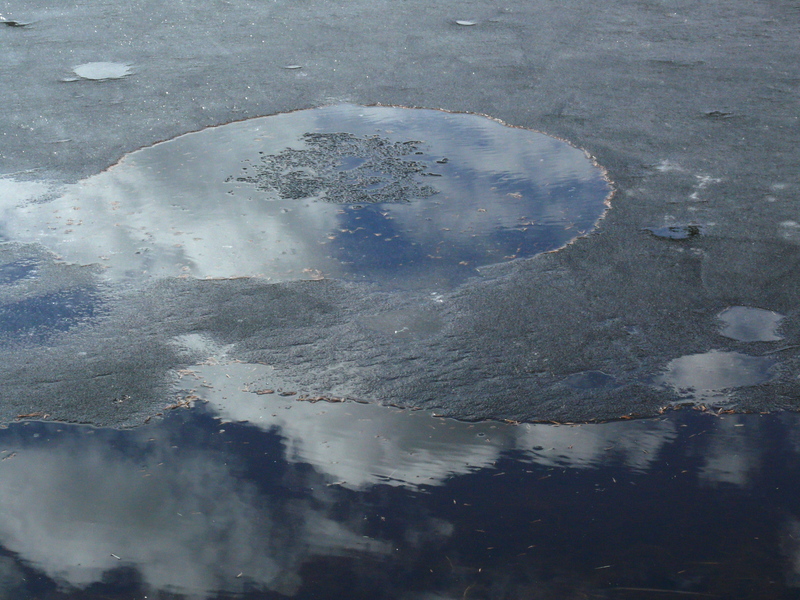 what secret hides in this reflecting water? that middle aged dog drinking from the beaver pond? the magic of clarity and light. 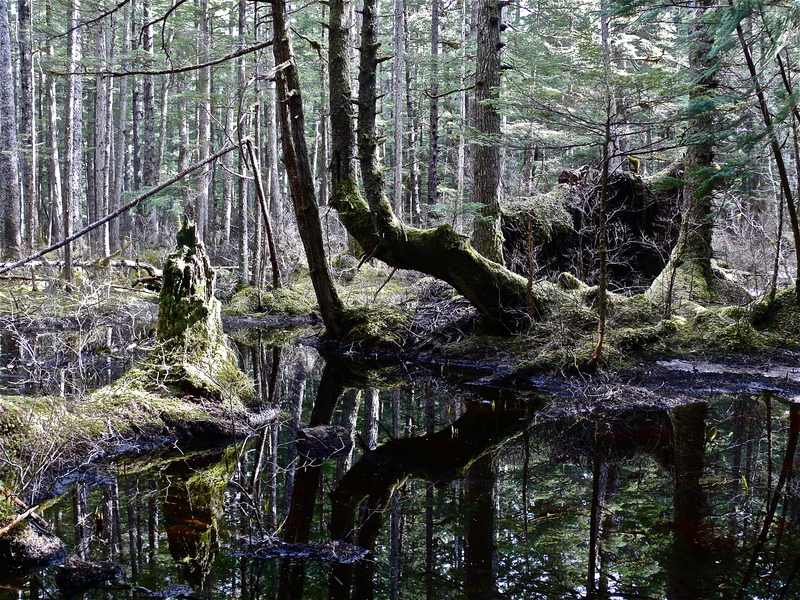 This entry was posted in Aki, Beavers, Dan Branch, Juneau, Nature, Poetry, Southeast Alaska, Uncategorized on April 13, 2014 by Dan Branch. Last Sunday, while ecstatic over victories of my favorite sports teams, I wrote on Facebook, “It can rain all week in Juneau.” It almost did. Yesterday broke clear and we had sun all day but it didn’t seem like Spring. That night, not expecting more than a cold wind, I took Aki out for her pre-bed eliminations. While she searched for a deserving place to leave her sent, I looked up at a thin green vapor trail. It swirled into a vortex over my head, spinning closer and closer until I reached up to touch it. Other vapors joined it, some painting streaks of green over Mt. Maria while others expanded into a curtain over Mt. Juneau. Not willing to look away from the Northern Lights, I am still not sure if Aki took care of business. She did this morning, on the walk up to Gasteneau Meadows. 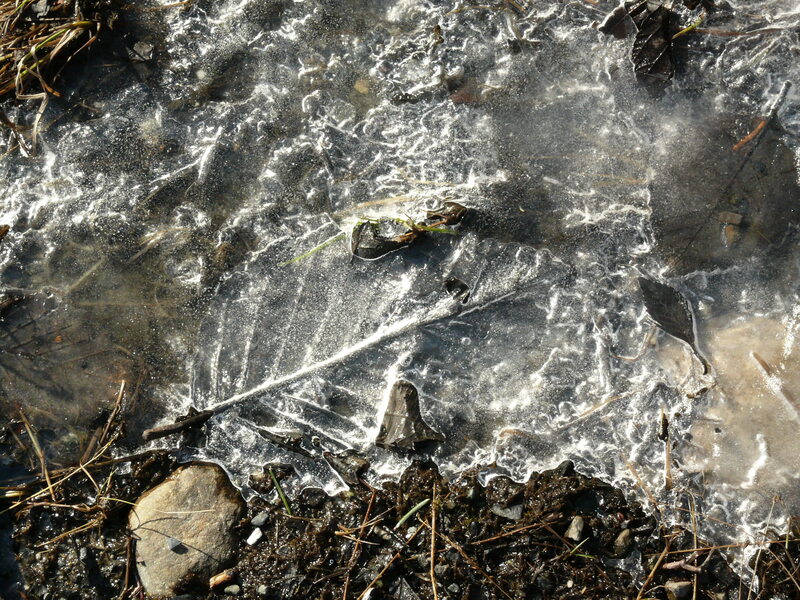 Cold settled over the meadow under last night’s Northern Lights to cover mud puddles on the approach road with thin panes of ice and hardened the meadow snow. The lights may have called the American robins north. We pass through a cloud of them traveling in the company of at least one thrush and a couple of grumpy jays. The Auroras may also have awaked the bear that dropped off the meadow after this morning’s sun rise. Our tracks cross the ones he left in softening snow. On the thinning meadow snow blanket we also find fresh tracks of an adult deer and later one that just survived its first winter. 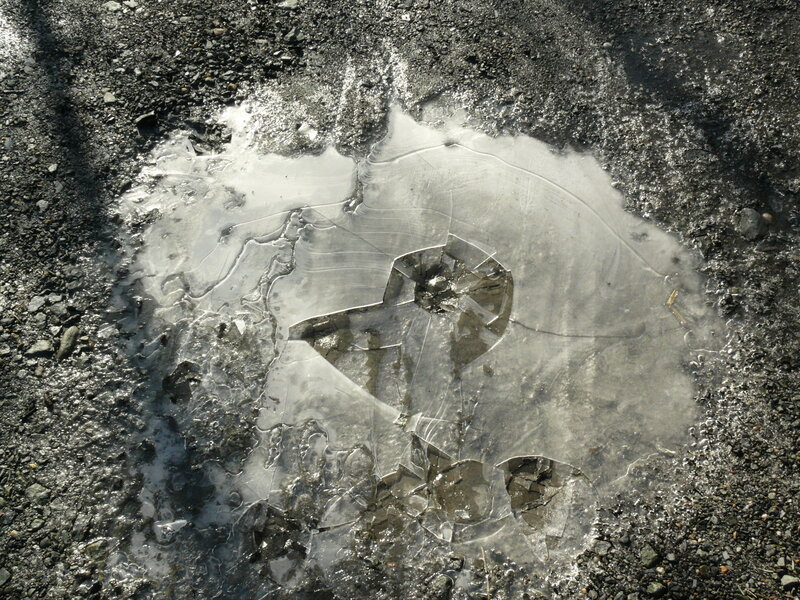 This entry was posted in Aki, Dan Branch, Juneau, Nature, Southeast Alaska on April 12, 2014 by Dan Branch.